With momentum building in support of Texas legislation to eliminate arrests for non-jailable offenses, Grits should respond to a red herring argument being trotted out in reaction to Sen. Konni Burton's SB 271 and Rep. James White's HB 567: That Timothy McVeigh, bomber of the Oklahoma City federal building in the '90s, was arrested at a traffic stop and might not have been captured if the incident were governed by the proposed statutes. This is such horse-hockey, Grits at first didn't consider the point worth countering. But a couple of folks have brought it up now and apparently it's a principle argument opponents are trotting around in response to the bill, so let's get the obvious rebuttal out there. As anyone would discover through the most cursory examination, Timothy McVeigh was arrested not for a non-jailable traffic violation (although that's why he was pulled over), but because he informed the state trooper who stopped him that he was in possession of an illegal firearm. That's what triggered his arrest. Under Texas' proposed legislation, police can still arrest individuals who are in possession of illegal weapons or who are committing other crimes if they fall into higher offense categories. So, because McVeigh wasn't arrested for a non-jailable traffic offense, his example just isn't applicable. Police at traffic stops always have the opportunity to watch out for more serious crimes, as happened during McVeigh's arrest. The Texas legislation merely protects drivers from arrest when the traffic offense (or other Class C misdemeanor) is the only alleged criminal act, as happened when a Texas state trooper decided to arrest Sandra Bland. If that phony argument is the best opponents have got, this bill's chances are looking pretty good. Go here to tell your state legislators to sign onto these bills as supporters and help pass them during the 85th Texas Legislature. My big worry is less the "ZOMG a terrorist won't get arrested", than that dirty cops will trump up even more serious charges when they have decided that they want to arrest someone. On the whole, though, that fear is not enough to overcome the good this law would do. We need this law. Wow, Phelps, I misjudged you by your previous comments. We do indeed need this law. I too worry about trumped-up charges from angry cops. How can you be so in favor of this, when you were so confident the FWPD officer arrived at Ms. Craig's house ready to arrest her for traffic warrants? And you called me the hypocrite. You're just a barrel of laughs. He had not only probable cause, but a legal duty to arrest her on sight. I'm not sure what reality you live in, but in America, when a duly appointed judge orders you arrested (the commitment charge she was arrested on),you get arrested. Being black, angry and on video doesn't get you out if it. Perhaps you are arguing for an abandonment of the rule of law, and for angry black people to get special privileges. If so, argue for it. @Phelps, you're just making stuff up on that case right and left, and none of it matches the video. There is zero evidence he knew about the warrants when he arrested her and all the circumstantial evidence runs the other direction. She was arrested for contempt of cop, that was quite evident from the video. It's clear he only found out later she had warrants. If he knew before then, as you claim, then he'd failed to act until he'd baited her repeatedly and she raised her voice (the actual reason he arrested her), so that again puts the lie to your "legal duty" argument. Even if you're right, you're wrong. Phelps is a sociopath...if you go back and read some of his luny posts you can clearly see something just isn't right with him. Personally, i like the police having the discretion to make an arrest for a Class "C." There are any number of investigative circumstances where the need to put someone in jail for some reason, any reason, becomes important. Perhaps the person is suspected of being a fugitive on an out of state warrant but the computer system is down? Or maybe the the person is suspected of having committed a violent crime but there's not PC to make an immediate arrest and yet the officer needs to have something to hold the person to keep them from fleeing? I get that the whole theme of this blog is pro-criminal, anti-incarceration, close prisons, etc…. But at some point, public safety must be balanced against your quest for anarchy and lawlessness. 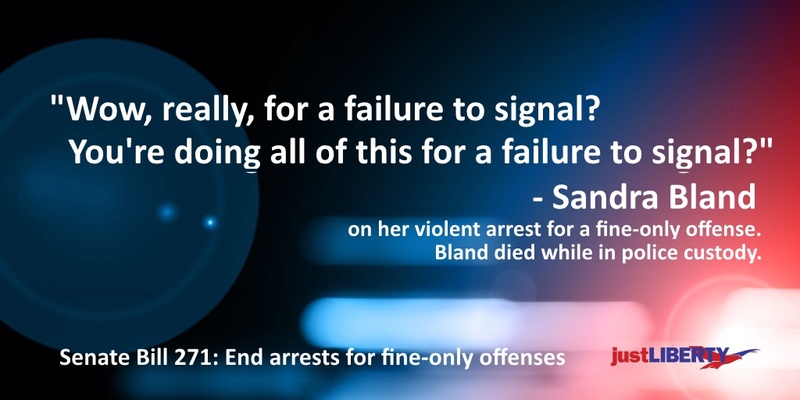 Sandra Bland's suicide, while tragic, is simply no justification for changing decades of effective criminal justice policy. I do not agree giving cops the option to arrest for a non-arrestable offense. Cops do it now and it is all about the money and not crime deterrence. The cop who arrested Sandra Bland was indicted because he lied about the incident. Cops are known to lie and fabricate causes for arrest. Pre-Crime confinement is the "thought crime" of arresting for a possible future criminal act. Remember all but two states signed a contract with the private commercial prison system to keep the prisons at a certain level. Although, the statistics show crime has gone down in this country the prison population has not. We are either free or slaves to the cops and government. Even traffic tickets is about the money. If you read the Transportation Code you will find that Texas Transportation Code, Chapter 201, Sec. 201.904. SPEED SIGNS only apply to commercial vehicles, but cops fraudulently give tickets to private automobiles all the time. Again it is all about the money. It's interesting how you all chose to take someone who was agreeing with you and attack him and argue. If you are still wondering why you keep losing elections, look at this thread. Sociopath indeed. It seems Phelps is just here to push buttons and piss people off. He seems to have no other goal, as far as Texas criminal justice issues are concerned. And to all of the people who label this blog, "Pro-crime", "Pro-criminal", "Anti-LE", perhaps you should take a step back and look at the real issues. Do we really want a system, such as the current one in Texas, that all but ENCOURAGES recidivism? Take someone released from prison, teeth missing from the lovely lack of medical/dental care provided by TDCJ. If they don't have any family or resources in the county they are headed to, do you really think $100 and a halfway house breathing down their neck for $600+ per month, will encourage them to obey the letter of the law? People then say, "Why should I have to pay for some convict's medical/dental care?" Would you rather pay for said convict to spend the next 30 years cycling in and out of the prison system, because we don't want to release him in an employable condition, readily able to contribute to society? TDCJ would make dentures for offenders until 2003. Then budget cuts. They were the cheapest, crappiest dentures out there, but they sure would make someone much more employable. TDCJ says now, that they will provide an offender with dentures if there is "significant medical need", however that is just another farce worthy of one of Phelps' posts. This blog is certainly not pro-crime. It is about the astoundingly simple fixes that exist to these stupid, often antiquated, public policy decisions that do nothing more than keep the prisons full, at all costs. Rehabilitation in Texas is a sick joke, the way things are now. People will call me a liberal, a socialist kyke, I just don't care. These things need to be changed, and I admire Grits for doing all that he does, and sticking to it. You all have convinced me. I was wrong. We don't need this law. One thing is certain: Regardless of where one lands on the political spectrum, nobody who survives an encounter with a dirty cop will continue to support the corrupt police state we've been growing here in Texas, much less the kleptocrats who slither into the legislature, where they are a threat to natural rights and freedom. 8:57 in Texas and has been the law for years, officers can arrest without a warrant persons found in suspicious places and under circumstances which reasonably show that such persons have been guilty of some felony, violation of Title 9, Chapter 42, Penal Code, breach of the peace, or offense under Section 49.02, Penal Code, or threaten, or are about to commit some offense against the laws. You argument is baseless. 9:20 I agree in part class c arrests are somewhat about money but more about the 3 things; using the arrest as a pre-text to search a vehicle prior to impounding, conducting a more thorough search of the defendant at booking for dugs, and arresting one who is mentally ill so county jails can babysit rather than the arresting officer taking the time to divert said individual to an appropriate mental health facility. One other thing I would add, I'm mostly for the legislation but have a problem with allowing an unlicensed driver to continue down the road. An unlicensed driver being one whose never had a license issued or and not one whose license is invalid because of failing to pay a surcharge. Rudeness or racism? And we should care, why?